Our GMP group meter panels are particularly suitable for installation in apartment blocks, as they are an economical and practical modular solution for enabling multi-apartment tenancy metering. A Modular solution for multi tenancy installations up to 63A. Starting from 6 x 1 phase or 3 x 3 phase meters. The most versatile group meter panels you can buy. 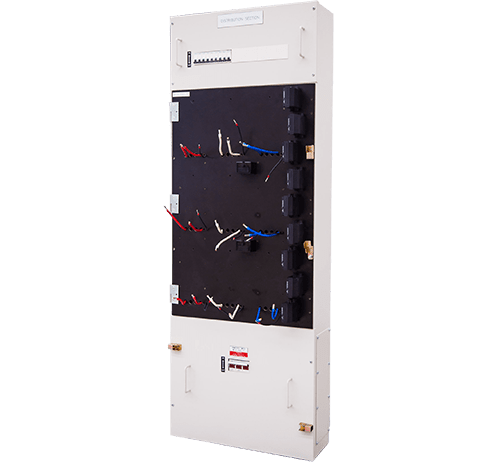 GMP series group metering panels are popular for providing economical and practical solutions for multi-apartment tenancy metering. In other words, we’ve found a way to keep the price down and the results up. 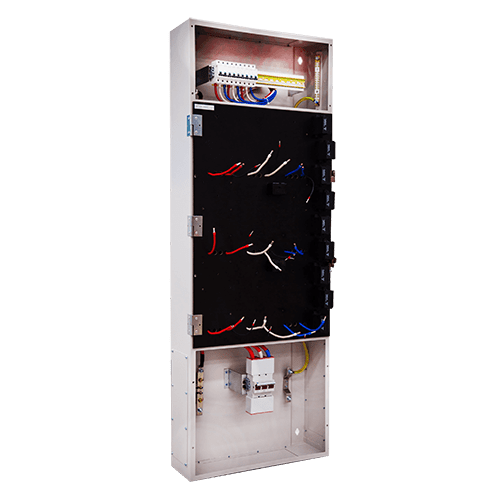 These panels come complete with service disconnection devices, meter panel isolators, service fuses and outgoing circuit breakers, fully wired in compliance with local service installation rules. To order a DaRa group panel meter, send your specifications to our sales and engineering team for pricing. Our estimators will select the most suitable group meter panel based on your application and whether it’s going to be installed indoors or outdoors, wall mounted or free standing. We’ll then send you a quote together with the specifications of the group meter panel. Once you’ve confirmed your order, our design engineers will get to work to generate the approval and construction drawings, which you’ll receive within 48-72 hours. Only when you’re happy with these, will we assemble the switchboard and fit the required electrical equipment, including switches, controls and circuit breakers, in line with the specifications and electrical drawings. The manufacturing process is carried out in our custom switchboard production plant in Mulgrave, and depending on the complexity of your group meter panel, can take anything from 5 to 20 working days; although stock standards group meter panels are usually completed within 2 – 5 working days in our express production plant in Cranbourne. Following final testing and QA, we’ll deliver your panel board to your site. If you require any further information about our group meter panels or you’d like us to quote for standard or custom meter panels, call our sales and engineering team on 03 8544 3300, send an email to info@dara-switchboards.com.au, or complete our online contact form and we’ll get back to you as soon as possible. This innovative modular solution is suitable for multi-tenancy installations up to 63A, and comes with removable lift off escutcheons, removable top and side gland plates and, depending on the site, can be wall mounted or floor mounted using a channel plinth. All our meter panels are designed in compliance with AS/NZS3000, AS/NZS 61439, AS/NZS 3439.1 and follow all relevant service installation rules per state. Quotes are the sent to the customers. When customers place orders, we use an advanced online design software and AutoCAD design tools to generate the approval and construction drawings (generally within 48-72 hours). Upon approval of the shop drawings, the switchboards are assembled and fitted with required electrical equipment (circuit breakers, switches, controls etc) and wired to specifications and electrical drawings. The manufacturing process takes from 5 to 20 working days based on the complexity of the group meter panel. Stock standard group meter panels will be completed within 2-5 working days. Panel boards are then delivered to customers after final testing and QA. What is the design standard used for manufacturing meter panels? Our design engineers will design the meter panels in compliance with AS/NZS3000, AS/NZS61439, AS/NZS 3439.1 and follow all relevant service installation rules per state. Can the meter panels be installed outdoors? Not all types of meter panels can be installed outdoor. DaRa switchboards manufacture DSS types of group meter panels that are NATA certified for IP56 rating. Economical range, indoor standard type group meter panels are also manufactured and stocked at DaRa for quick deliveries. Which circuit breakers are used in DaRa Group Meter Panels? Can DaRa Switchboards manufacture custom group meter panel boards? Our speciality is in manufacturing custom group metering panels using our fully integrated manufacturing facility. We can custom make switchboards with many combinations of single phase and three phase tenancy metering, supply capacity control, service protection, public light and power distribution sections with lighting controls. How long does it take to manufacture a meter panel? Standard meter panels are turned around within 5 working days from order and approval of shop drawings in our express production plant in Cranbourne while the custom meter boards will be manufactured within 20 working days from order and approval of shop drawings in our custom switchboard production plant in Mulgrave.